EU researchers would overwhelm existing visa system and should retain special access to the United Kingdom, say science organizations. The UK immigration system may need to process tens of thousands more visas for scientists each year if European Union citizens lose their special immigration rights after Brexit, figures obtained by Nature suggest. The numbers underscore the urgent need for reform of the rules governing immigration for researchers — a topic that a parliamentary group has been investigating since May. Immigration data gathered by Nature also highlight that the current system is not working well for scientists who come from outside the EU, irrespective of Brexit. One type of visa called Tier 1 Exceptional Talent — designed to attract leaders and emerging leaders from overseas, largely in the sciences and engineering — is vastly underused, with only about half of a possible 1,000 visas taken up last year. But another visa for highly skilled workers, called Tier 2 and commonly used by scientists, is highly oversubscribed, as well as time-consuming and costly to obtain. And non-EU researchers already often struggle to get visas for short visits for conferences and collaboration. Despite recent tweaks to immigration rules in favour of researchers, many scientists see Brexit as an opportunity for further, much-needed reform to the entire system for highly skilled workers. “Maybe when the dust settles we can get a system that’s better for those coming from all over the world,” says Richard Catlow, who is foreign secretary at the Royal Society in London. Immigration data requested by Nature from the UK Home Office under the Freedom of Information Act show that the United Kingdom approved visas for about 20,000 academic researchers and non-academic PhD-level research professionals from outside the EU in the 2016–17 academic year (see ‘Researcher mobility after Brexit’). Because EU nationals currently have automatic rights to work in and travel freely to the United Kingdom, comparable figures for the number of European researchers entering the country do not exist. However, data from the Higher Education Statistics Agency show that over the same period UK universities hired about 10,500 researchers who were EU nationals: 5,760 full-time academics and 4,835 postgraduate research students. And calculations by Nature, based on migration data and annual labour surveys, suggest that each year thousands more EU citizens take up research roles in UK industry, charities and government. Neither count includes visitors coming to Britain on short trips, such as to attend conferences or for collaboration meetings. But data from the UK Office of National Statistics shows that in 2016, EU residents made more than three times as many business visits — which would include short, scientific trips — than did citizens from the rest of the world combined. After Brexit, many of these thousands of EU researchers coming to Britain are likely to need some form of visa (the United Kingdom leaves the EU in March 2019, but EU nationals retain their current rights until the end of 2020). “These numbers tell us that if you were going to expand the non-EU system, it would have to deal with an approximate doubling in capacity,” says Sarah Main, executive director of the London-based Campaign for Science and Engineering (CaSE). Main and Catlow are two of the many representatives of science organizations and researchers who have submitted evidence to the parliamentary inquiry, set up by the House of Commons’ science and technology committee to address the issue of researcher mobility in the wake of Brexit. The government has pledged to restrict migration from the bloc, but it is yet to publish its long-awaited overall plans for immigration after the departure; senior ministers remain split on whether EU citizens should be given preferential treatment over immigrants from the rest of the world. The committee hopes its recommendations will inspire immigration solutions that would best serve science, says Norman Lamb, the member of parliament leading the inquiry. There are many people who would be alarmed by the idea of fitting EU citizens into the existing system without any adjustment, he says. 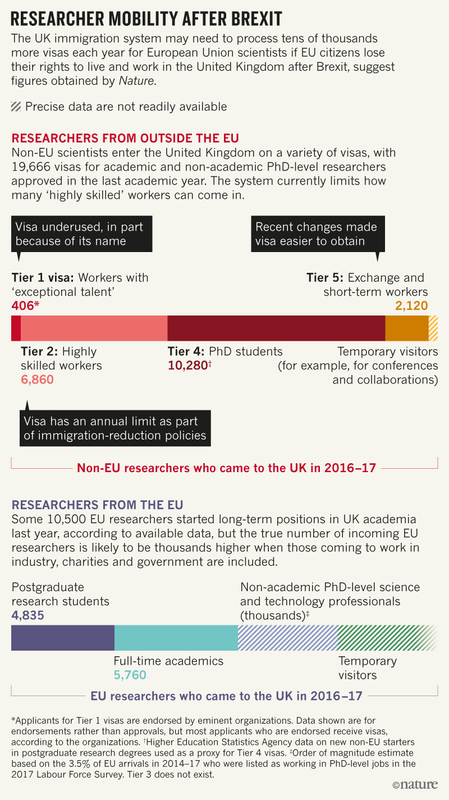 Research organizations responding to the inquiry say that one straightforward option for reform is to permanently remove a cap on Tier 2 visas, the channel through which most non-EU scientists come to work in the United Kingdom. The cap, put in place as part of government efforts to reduce overall immigration, is unpopular irrespective of Brexit: between December and March, for instance, it meant that 3,500 eligible technicians, engineers, and science and technology professionals were refused visas. Scrapping the cap has growing support in the government, says Jonathan Portes, an economist at Kings College London who is leading a project on how Brexit is likely to affect immigration. Earlier this year, the government decided that the cap would no longer apply to doctors and nurses, raising hopes for further changes. And on 6 July, the government announced immediate changes to a different visa route, called Tier 5, that will expand the range of institutions that can sponsor researchers and technicians to be hired on placements of up to two years. “It’s another positive visa change that’s means the government is moving in the right direction,” says Main. Researchers say that Brexit also offers an opportunity to address the expense and long waiting times for visas. When various charges, such as those for obtaining sponsorship documents, are tallied, a five-year visa for highly skilled work costs about £16,000 (US$21,000) for a researcher with a family of five, and is expected to rise to £21,000 from September, according to calculations by Fragomen, a law firm that advises on immigration issues. “No other country even comes close to how expensive we are,” Ian Robinson, who advises on immigration policy at the firm, told the inquiry during a hearing on 19 June. For a new hire, the process can take up to six months, he added. Organizations responding to the inquiry say that overhauling the entire system for highly skilled workers is a priority — but some worry that it is unlikely to happen by the end of 2020. As a result, many of these bodies proposed mechanisms to the inquiry that would cater for EU nationals in the years directly following 2020 in order to address the immediate problem of researcher mobility. These mechanisms, if implemented successfully, would give the government more time to work on broader reform and could form the basis of a better overall system. One of these temporary measures, suggested by Main, would be to allow scientists from EU countries to continue to come to the United Kingdom without a visa immediately after 2020. She says they could use an online registration system for EU researchers, similar to the online portal the UK government already plans to launch to allow EU nationals already resident in the United Kingdom to register to stay after 2020. The Wellcome Trust, a biomedical charity in London, proposed that visa-free travel for conferences and collaboration visits — already available to US and Canadian nationals — should be extended to EU citizens for a period after 2020. For longer stays, the trust has suggested trialling a “science visa” for EU nationals; a body such as UK Research and Innovation, the national science funder, would endorse applicants with job offers to speed up their applications. Countries including Canada, France and Singapore already have visas specifically for researchers, the committee heard. Precedent for such a route exists in the Tier 1 visa, which relies on five eminent organizations — including the Royal Society and the Royal Academy of Engineering — to endorse candidates for approval. In 2017, the government increased the number of these visas available from 1,000 to 2,000. But data collected by Nature through freedom-of-information requests show that only 558 were endorsed in 2016–17, with just 406 in science and technology fields. Catlow says that this is, in part, because the name of the visa suggests that only the “elite of the elite” should apply, when any high achiever would be suitable. Negotiations about several aspects of the UK–EU relationship after Brexit are ongoing and it is still not clear through which avenue any provisions for researcher mobility might be made. 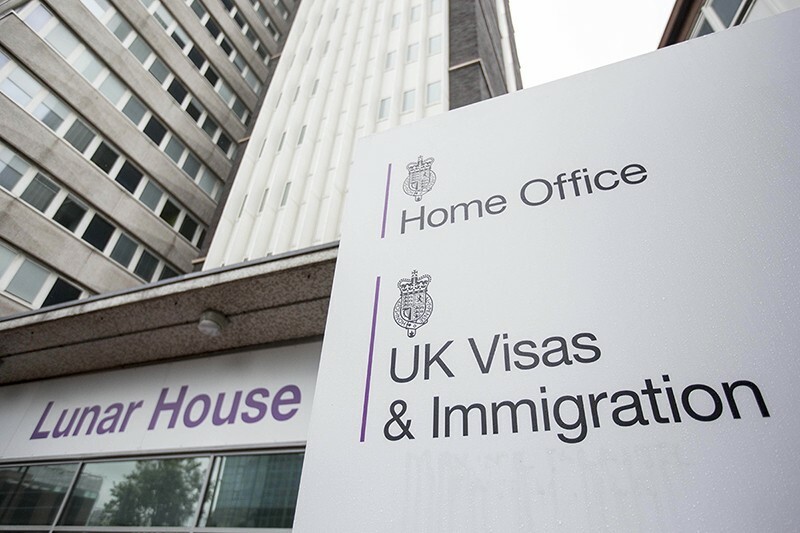 The UK government is expected to release its immigration plans after the Migration Advisory Committee, an independent body, publishes a report on the impact Brexit is likely to have on migration in September. But the government has also made it clear that it wants a special pact on science and innovation with the EU after Brexit, to allow the United Kingdom to access EU research money — and this could specify special measures for researchers. Science organizations say the decision cannot come soon enough. “Continued uncertainty not only makes it difficult for employers but damages the UK’s international reputation as a welcoming place for researchers and their families,” says Naomi Weir, deputy director of CaSE. Correction 12 July 2018: An earlier version of this story inaccurately described Ian Robinson as a lawyer at Fragomen.